Create an advanced root system! A unique advancement in container technology! The Smart Pot prunes roots as they reach the pot sides to spur horizontal root branching. A highly branched, fibrous root structure is the key to growing a better plant — with more flowers and fruits, and more resistance to insects and diseases. The soft-sided, fabric container has the rigidity to hold its shape and can even support large trees. Commercial tree growers have used the Smart Pot for over twenty years to establish healthy root growth before transplanting. 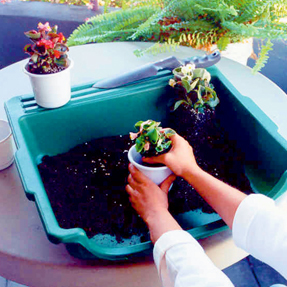 Use it as a container, raised bed or place it in a decorative pot to make transplanting easier. Sets of 3 Smart Pots. Choose from 3 gallon (10" x 7.5"), 5 gallon (12" x 9.5"), 7 gallon (14" x 9.5") or one of each. I have been using these pots now for a couple years. I have grown tomatoes, eggplants, peppers, and cucumbers in the pots. My harvests have been equally as good using these pots as a conventional pot. 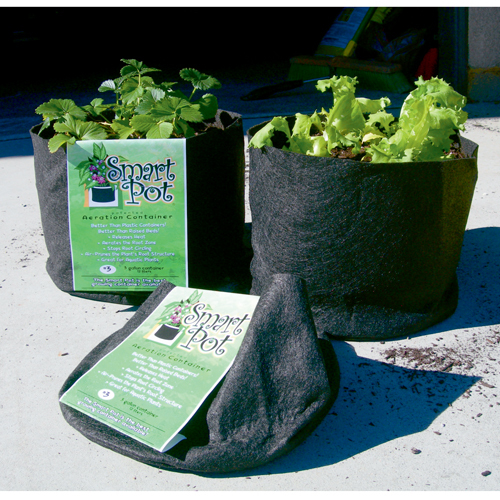 The plus of the smart pot: lightweight, easy to move store and reuse. Cons: seem to dry out quickly (I think because they are black and porous). I will say I am always amazed at the end of the season when emptying the pot, the roots are small and spread out and never compacted and tangled. Overall, you can grow a much bigger plant in a small pot. I grow tomatoes in the 3 gallon pot which would never work in a regular container - so there is a savings on the amount of soil that you need to use. 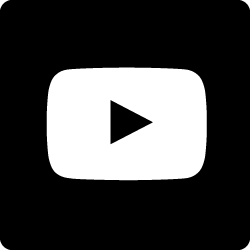 I would recommend them and will continue to use them. I like that they are so much lighter filled with soil than a clay pot is. I'll probably get more. The season is just beginning, so I can't comment on the watering needs. This will be my first year of using smart pots. I plan cover my garden with black sheeting and place the smart pots on top. Easy gardening and no weeds.